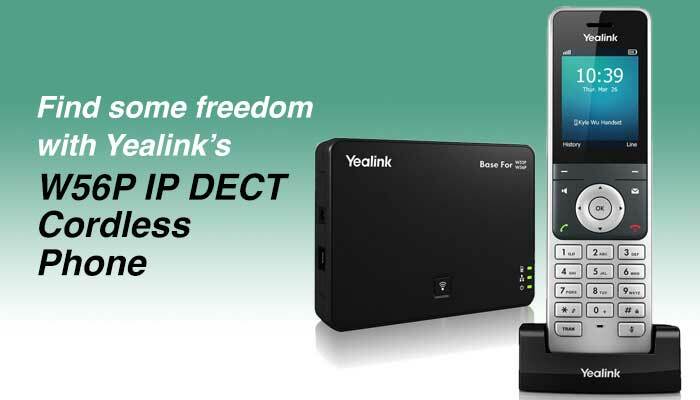 The Yealink W56P IP DECT Cordless Phone is the ideal device for users needing extended battery life while working “on the go”. It’s perfect for those who prefer to stand or walk while on the phone, and it really shines in retail stores, warehouses, factories, etc. where sitting at a desk just isn’t an option. The Yealink W56P package includes one W52/W56 base station and one W56H Handset, which is backwards compatible with the W52 base stations and repeaters. The device works seamlessly with UnitedCloud’s industry-leading cloud communication platform, giving you access to powerful features while you’re on the move. With up to 30 hours of talk time and 400 hours of standby time, you’ll rarely need to stop to recharge during the workday. Forget to charge? A short 10-minute quick charge will get you up and running quickly, giving you up to 2 hours of talk time. Each base station supports up to 5 cordless handsets and all will feature high-quality HD audio. Each handset features a large backlit LCD display and a 3.5mm headset jack, making it extremely handy in environments where you need to go hands-free. If the demands of your job keep you running, invest in the W56P IP DECT Cordless Phone to enjoy the freedom and productivity that comes with being cordless.